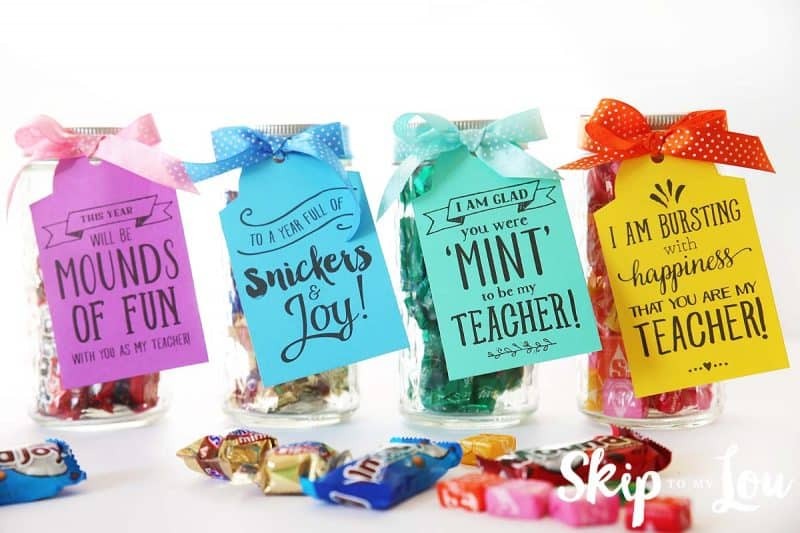 Pretty jars filled with candy make sweet back to school teacher gifts! 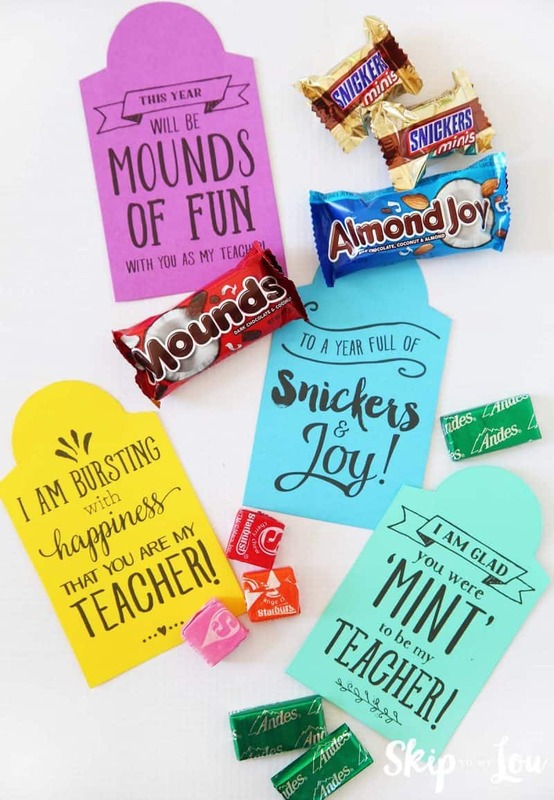 We are always looking for fun teacher gifts to celebrate all they do and these candy gram sayings work perfectly! These tags make it super easy to share a small token of appreciation! Everybody likes to feel appreciated. 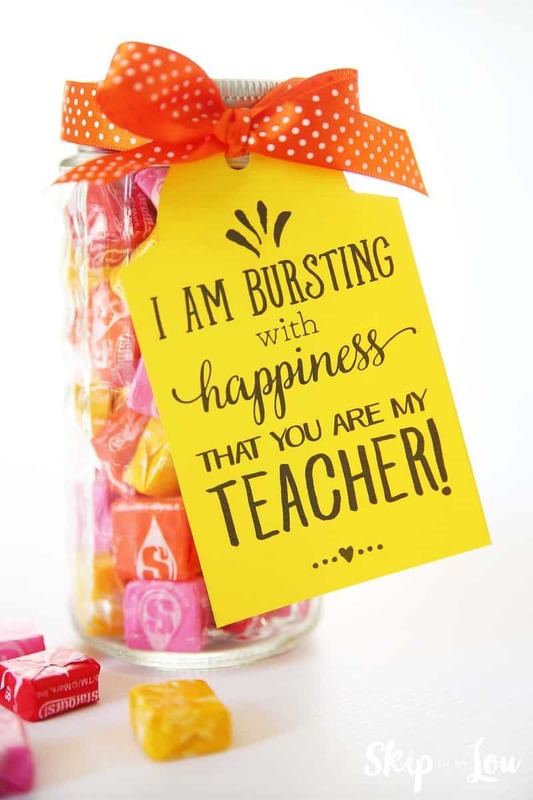 Be sure to scroll to the bottom for more AWESOME back to school teacher gifts ideas! You see candygrams all over the web. 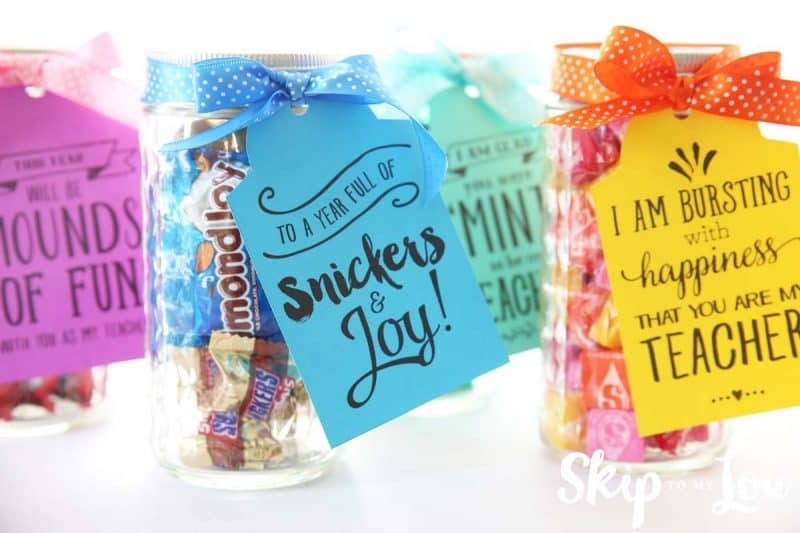 Those clever sayings where candy fits in for the words so you can sweet talk someone! Don’t snicker, but giving someone a candy bar is a fun and affordable way to show your appreciation. Here are some more sayings for candy. Let the number CRUNCHing begin! You always help out in a CRUNCH – thank you! I was MINT to be in your class! As a teacher, you’re no dud! MR, you’re one GOOD teacher! Wishing you MOUNDS of happiness and fun this summer! For someone who does MOUNDS of work everyday – thanks! You’re on a ROLL – great job! Don’t SNICKER, but I think you’re the greatest teacher! It’s a JOY to be in your class! You hit this school year out of the park! You make things BUTTER by working your FINGERS to the bone – thanks! I’d have to be nuts not to appreciate all you do! 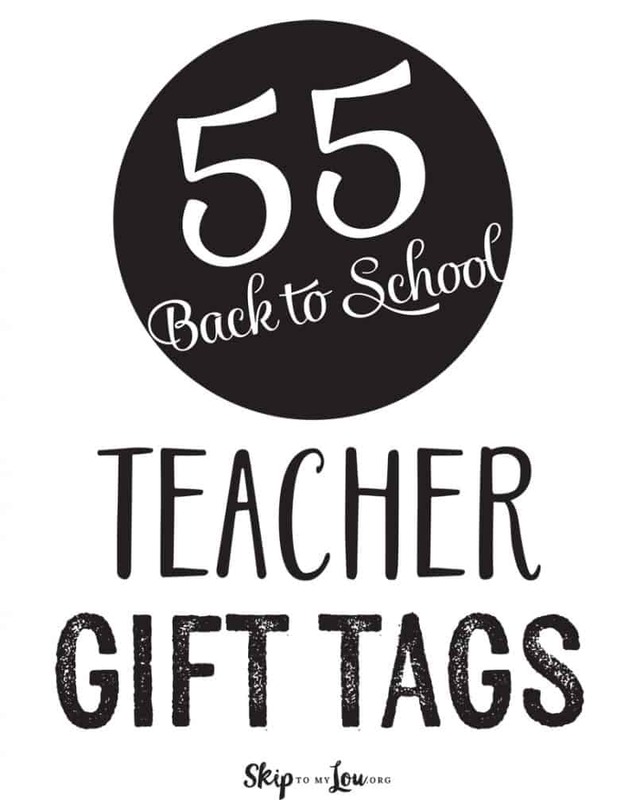 Download the free teacher gift tags. Print on card-stock, cut out. Grab the matching candies for each tag; Mounds, Snickers, Almond Joy, mints and Starbursts. The best part of this gift is that even if the teacher doesn’t have a sweet tooth, many teachers appreciate little sweets to share with students for incentives. Is your child thrilled with their new teacher? 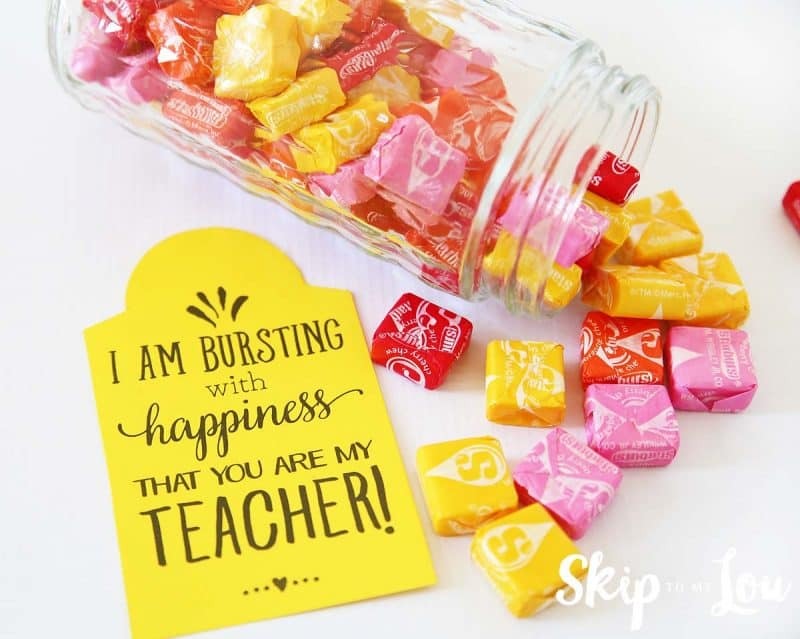 This “I am bursting with happiness that you are my teacher,” tag paired with starbursts will let their teacher know! What a bright and happy gift! Did your child get a fun teacher? 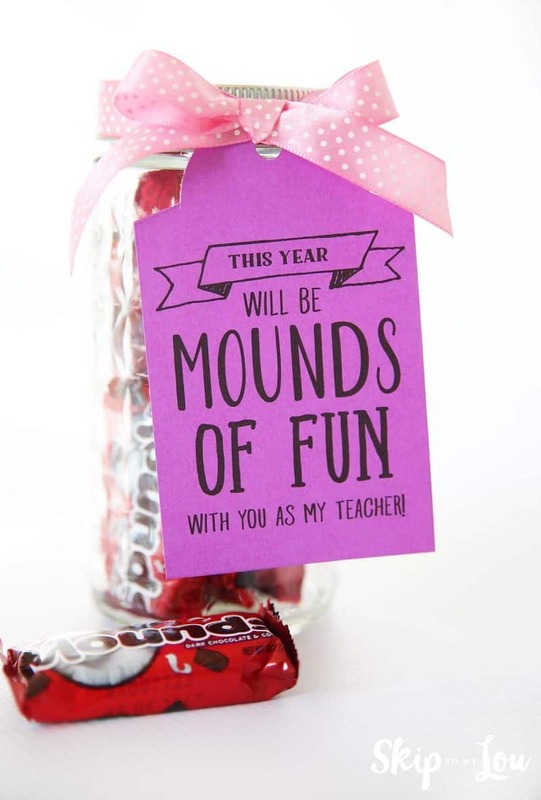 Pair this “This year will be mounds of fun with you as my teacher” tag with Mounds candy bars. It is always great when you get the teacher you hoped for! 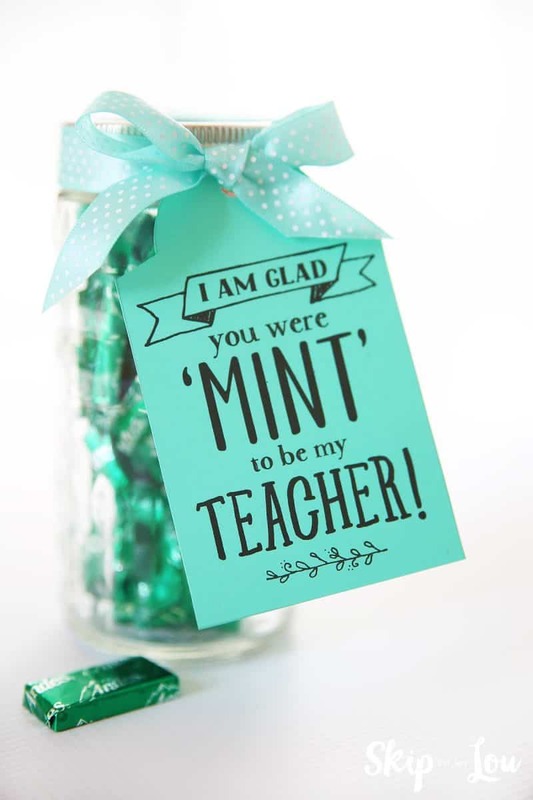 The “I am glad you were mint to be my teacher” tag will let your teacher know! Honor the new year with a positive and hopeful gift. 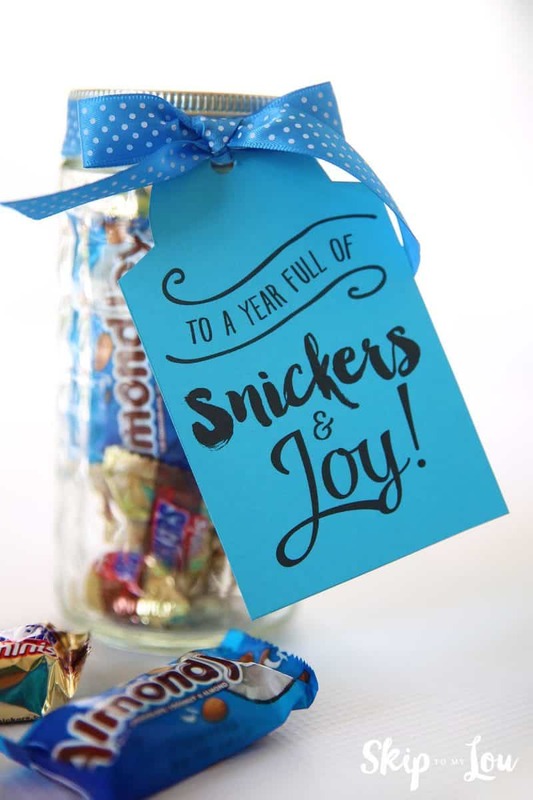 We all want our children to have a year of snickers and joy! 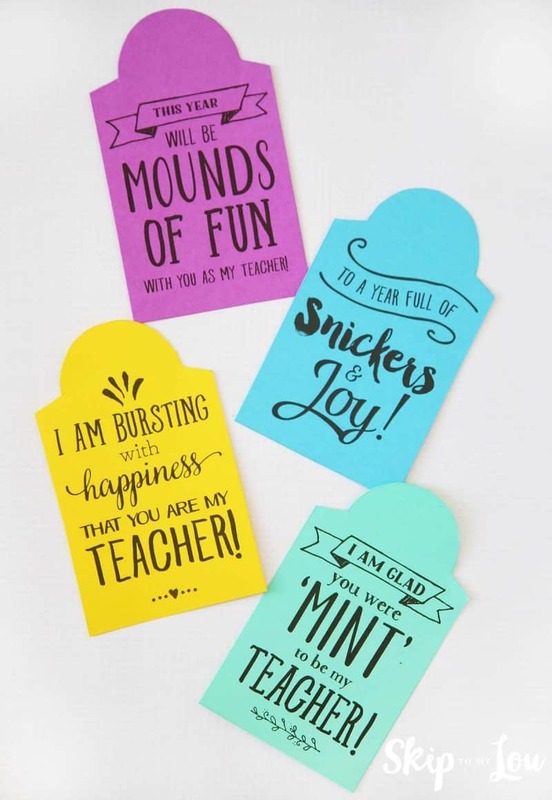 So many fun back to school teacher gifts! So there you have four easy ways to welcome teachers back to school! Want more? I have over 50 tags ready for you to print to make gift giving super easy. 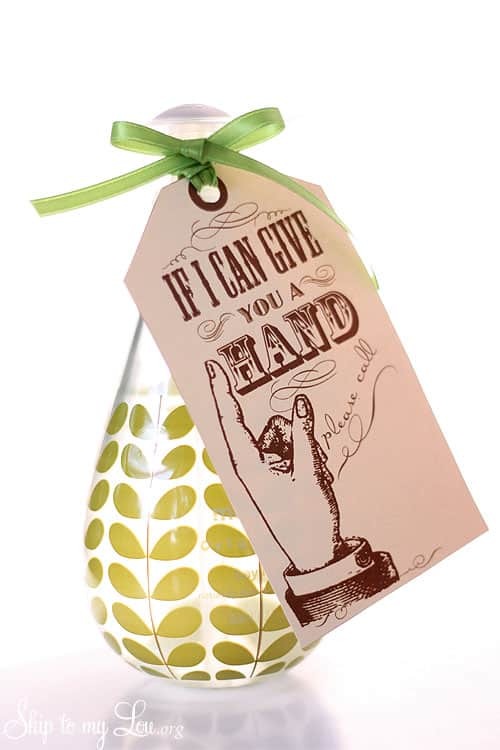 All you do is print a tag and attach to a little gift for a “Pun-tastic gift! Each tag even comes with gift ideas. Download 55 more tags for $4.95. Your teacher will be happy you did! Every teacher can use more post-it notes. It is super simple to print on the top sheet to make a cute gift that is also very useful! I always want to make sure the teacher knows I am willing to help. This hand soap gift is a clever way to give my contact information and let my child’s teacher know I am willing to lend a hand and makes perfect back to school teacher gifts! 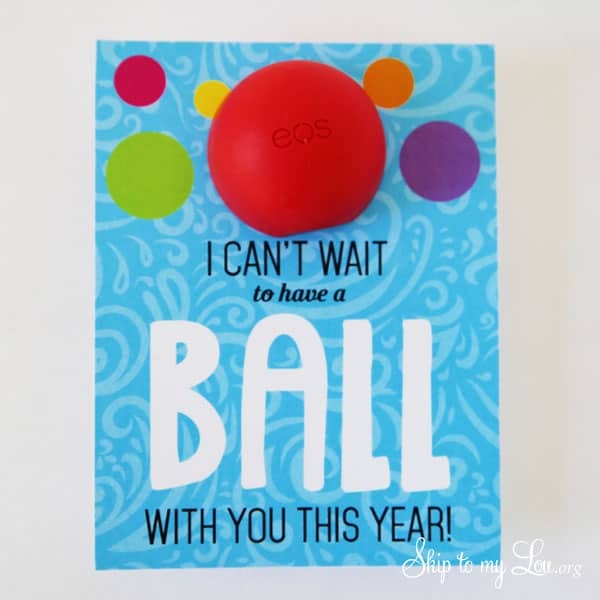 EOS always make for a fun gift and this printable card makes them perfect for back to school teacher gifts! 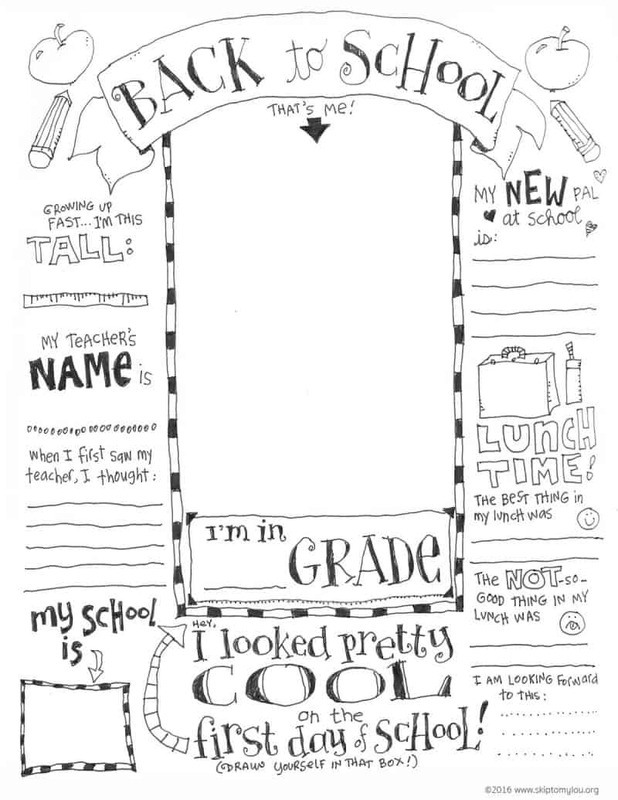 Don’t forget to help your child celebrate the first day of school with this darling Back to School Memory Printable! These are so fun, cute, and easy! 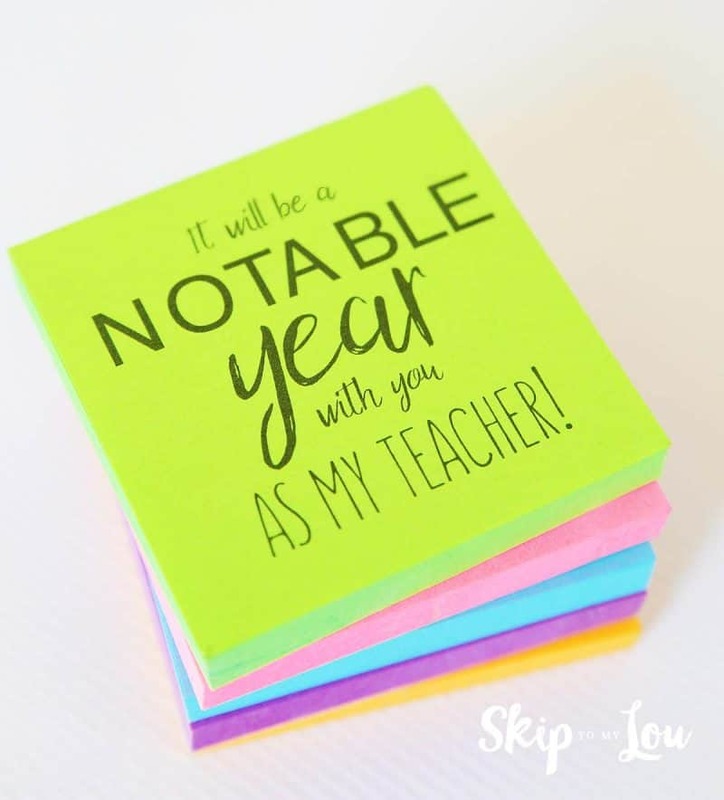 I can't wait to make these for my kid's teachers!